I always know when summer is around the corner because I start to receive the latest furniture catalogues. 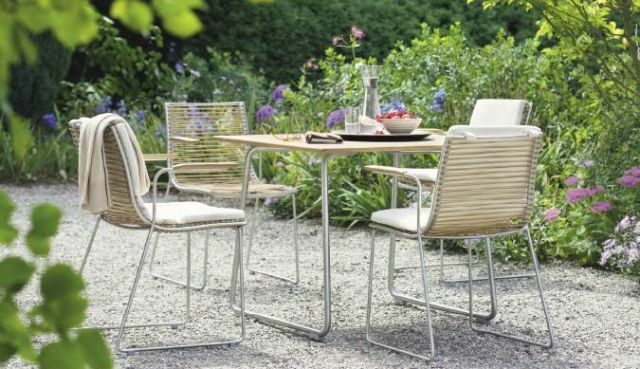 I suspect that most companies are keeping everything crossed that the weather will be kind enough to allow people to sit outside in the garden this year! Garpa is one that I receive every year and the furniture is beautiful. 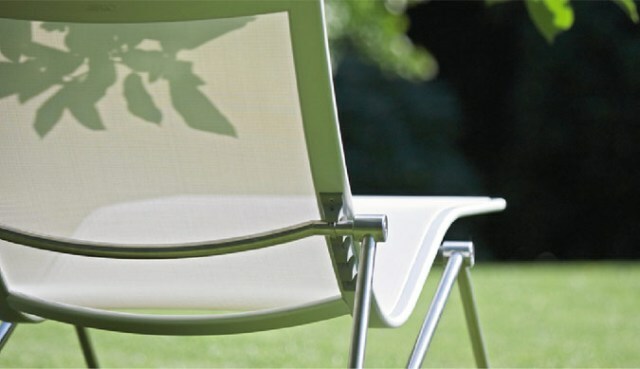 From their traditional ranges right through to the cushions and parasols, all their pieces are of the highest quality. This means that they have a price tag to reflect it, but I still wanted to share some of the pieces with you as many are a bit different to those that are widely available and there are also some great accessories. 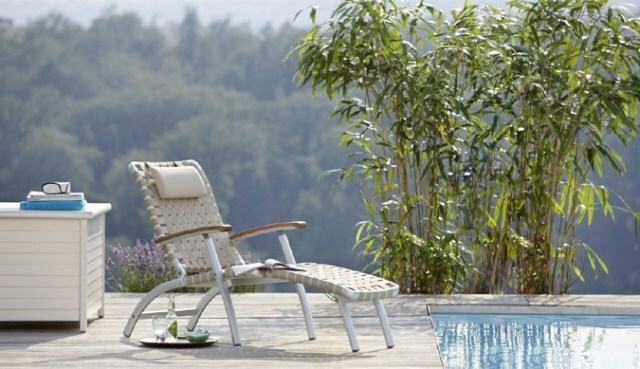 The Alassio chair would work really well in a small space because it converts to a lounger. You can just about see the fold-away foot rest under the seat of the chair. 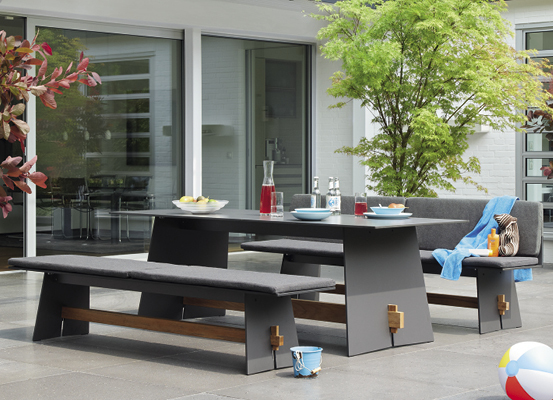 The Oktav bench seats and table would look great in a contemporary setting. They offer a bar table and stools too if you fancy something a bit different. Lounge furniture is becoming much more popular and I often suggest this as an alternative. Often I get involved when clients have embarked on a house building projec and nearly always this involves some sort of bi-folding doors which open out onto the garden. If the dining table is located just inside the doors, it doesn’t make much sense to have another table and chairs set on the terrace. The prado wooden lounge seating above is more classical than the more contemporary basket weave styles that you usually see. The Como range is a bit different too and is available as modular units to give flexibility depending on how much space you have. 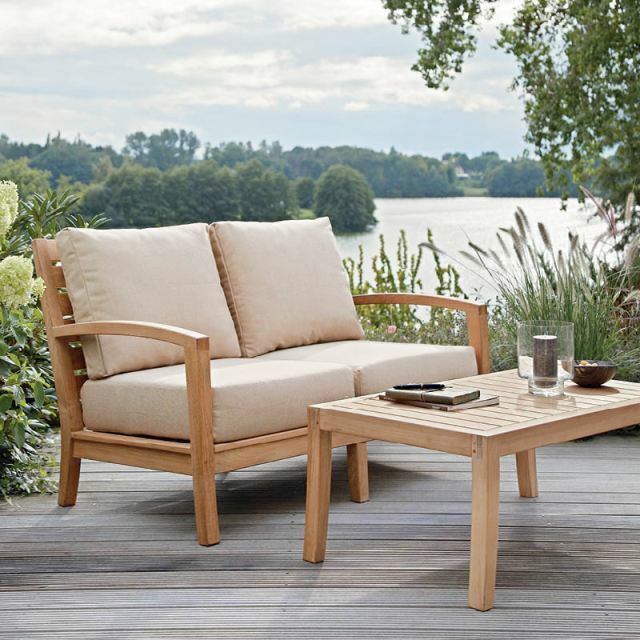 This range also has a chaise longue – lovely on a hot summer day! The pan collection has a contemporary feel to it. I love the chairs which I would imagine are really comfortable. 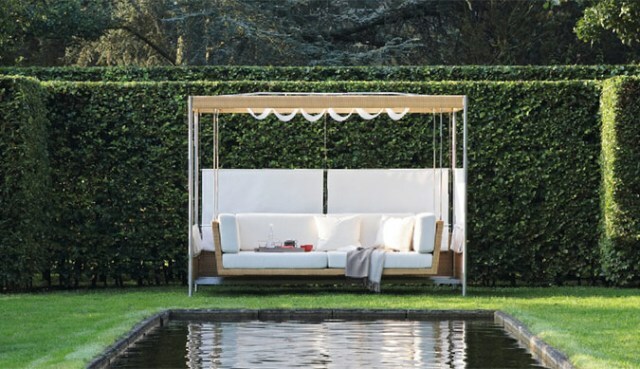 This swing bed is quite grand and perhaps would be better suited to warmer climates, but I imagine it could be very relaxing to sit and look out over your garden or view beyond, if you’re lucky enough to have one. The last two images feature accessories. 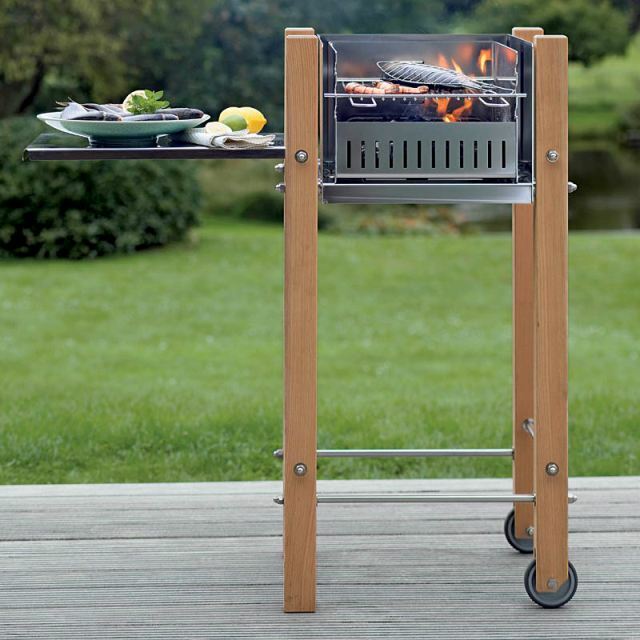 The first being a small grill which would fit quite well if you have limited space. I hope you agree that there are some beautiful pieces here and I urge you to have a look at the Garpa website to see the full range. They also offer a range of furniture for inside which means that you can create that connection between house and garden so much more easily. Now all we need is some warm sunshine! Thanks Debbie. Yes, bit of warm sunshine wouldn’t go a miss would it! 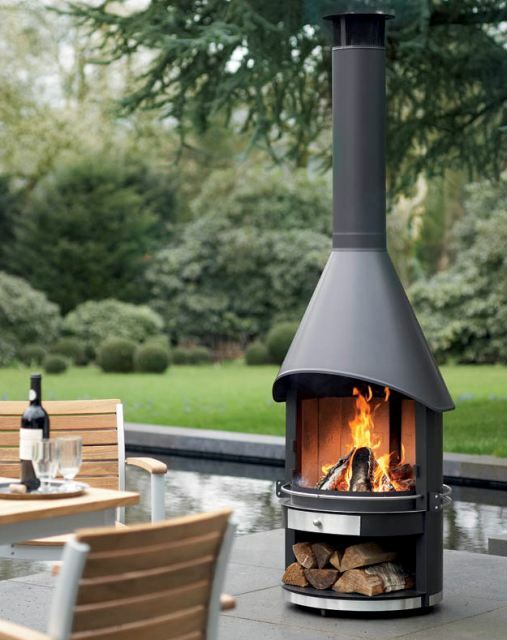 It would be wonderful to prolong the summer days and be able to enjoy the garden until late into the evening with such an elegant Garpa fire! Great post, I love this time of year when we have a glimmer of what’s to come (hopefully!) 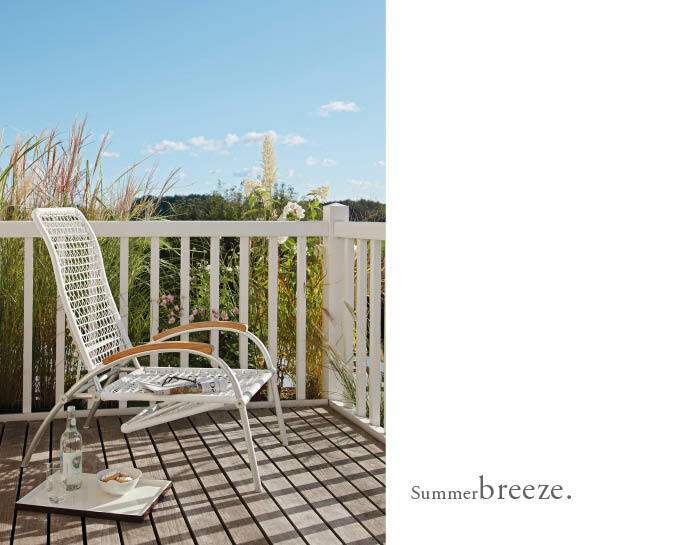 with sunny days and outdoor living. 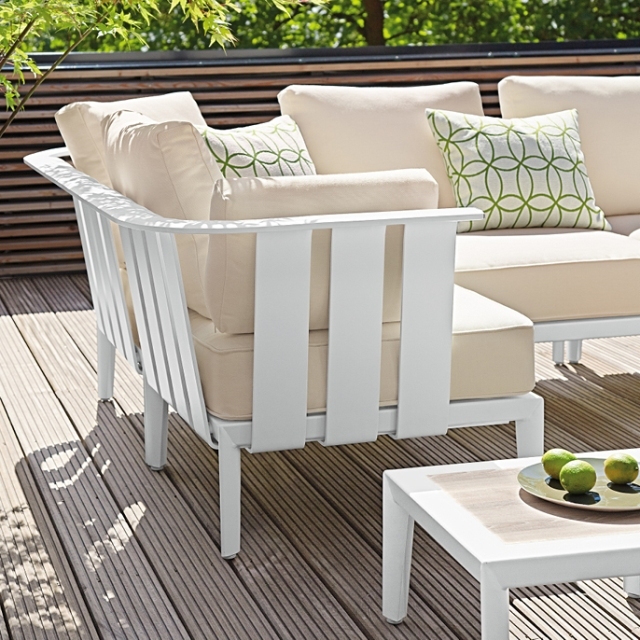 There’s so many ways to transform an outside space now and furniture can be key. I agree that more and more people seem to be incorporating bi-folding doors into rooms that open out onto the garden resulting in outdoor/indoor spaces. Contemporary, easy to maintain gardens can be stylish and relaxing – adding colour through outdoor furniture, rather than just flowers! Thanks Dave. Furniture is definitely key as it makes you want to go out there – function and style all wrapped into one!